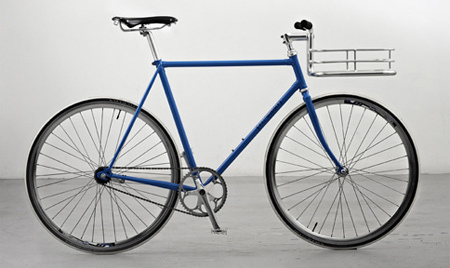 Collection of useful and creative bicycle accessories designed for people that spend a lot of time on their bikes. 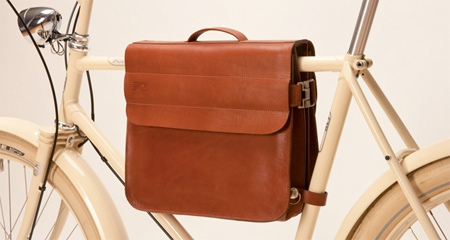 Compatible with many classic bike frames with horizontal top tubes, the frame bag features two compartments for A4 notebooks or laptops. 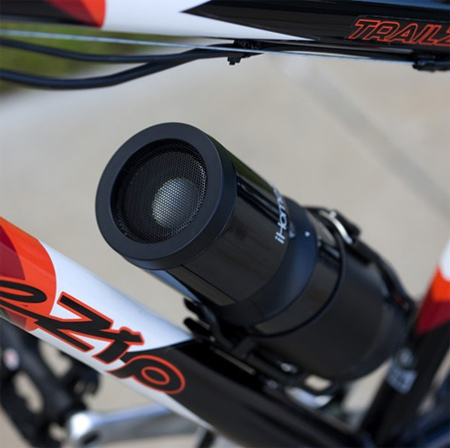 GoRide allows you to easily attach your Apple iPhone to your bike. 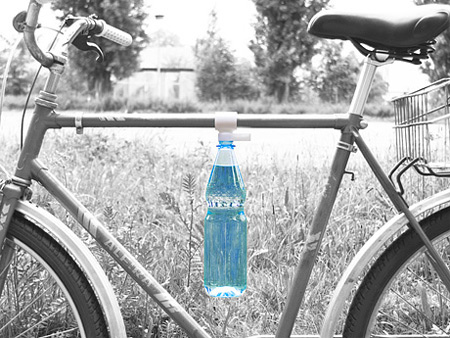 Bottle holder simply snaps onto any standard bicycle frame. Due to a normed thread most bottles can be screwed directly into the clip. 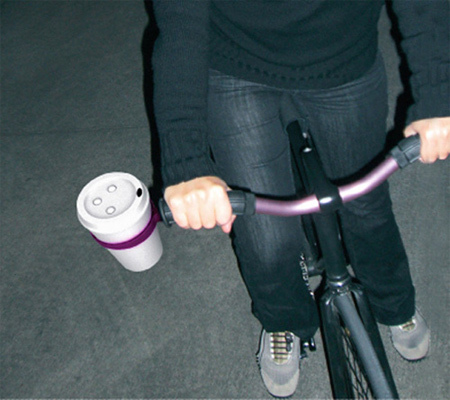 Ring-O-Star bicycle coffee cup holder designed by Paul Kweton. 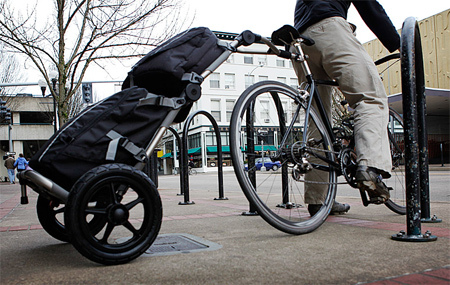 Fully collapsible trailer attaches to the seat post of your bicycle. 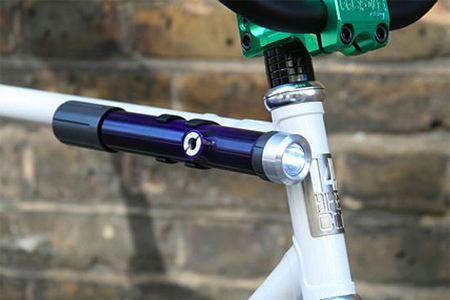 PUYL is a bicycle pump and portable light combined in one device. Perfect for all types of reading material; It mounts in seconds to virtually any road, mountain or stationary bike. Portable speaker system lets you listen to your iPod while biking. 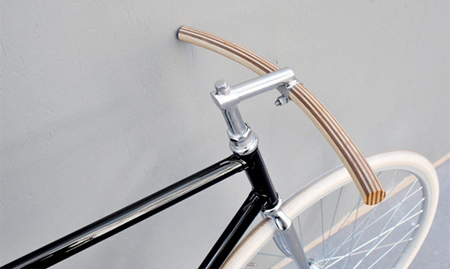 Workerman handlebars are all handcrafted out of quality hardwood. 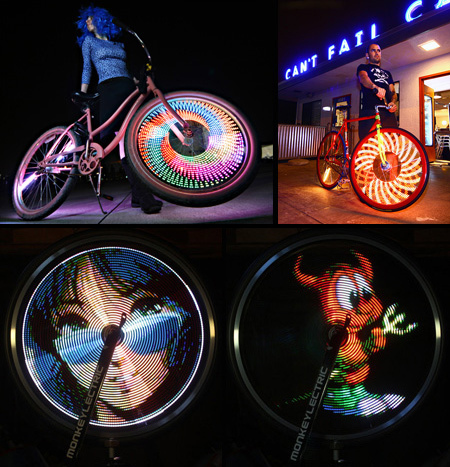 MonkeyLectric allows cyclists to display images on spinning wheels. Stylish basket integrated into the handlebar by Copenhagen Parts. 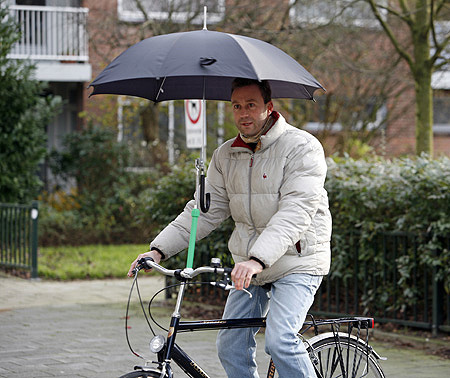 Drybike mount will hold your umbrella and protect you from rain. What’s the point of the book mount? I’d crash immediately. same here samkinkel! I want all of them exept for the book mount. The power of creativity! I want the book mount… don’t know what I’d do with the rest except get distracted and crash. The book mount is a great idea for those of us in wintery climates when you’ve got your bike up on the stationary in the house. I have umbrella mounts in Japan too..
You’d still get wet with an umbrella if youre moving at all…. Unless it tilts, but then it would just obstruct your view…Pointless. My favorite is the trailer! Anyone remember a book about Mrs. Armitage? I overshot my turn by fifteen minutes using that bookmount while reading “How to Make Time Work For You Instead of Against You”. Wouldn’t want to crash with a full cup of coffee! The Book Holder, formerly known as the accident creator. but if you’re stationary, then it’s pretty easy to hold whatever you’re reading, no? i am definitly getting the Ipod speakers, cause its so annoying riding your bike with headphones popping outa your ears. 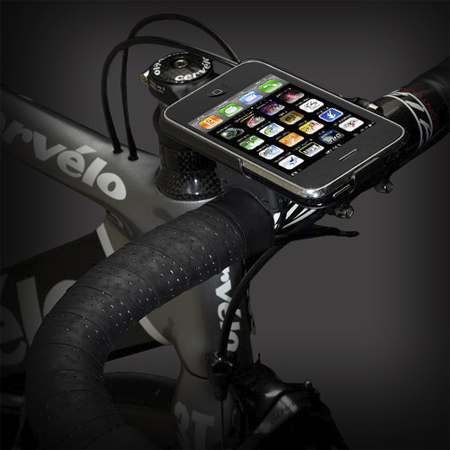 I 1t a Iphone bike, It’s really cool! With a couple of bulldog clips, the book mount might work nicely for large cue sheets. I like the handlebar/basket combo. If you download audio books onto your iphone and used the Bicycle ipod speaker…you wouldn’t need the book holder. I just made the bookholder obsolete. Sorry. Book Holder is good for maps, useful in long travels. How is no one talking about the wheel display system!? am i the only one who thinks thats cool? and chris who made the book mount obsolete is smart. the umbrella mount only keep you dry when you are stationary. People don’t get the book holder! It’s for when you stop, you read. For example, when you couldn’t bother to take a book out of your bag, you could just read it on the spot, then ride again once they’ve finished reading. Boom, I just owned about 5 people. For those who don’t like the book holder, it is a very useful accessory when using the bike indoors on a resistance trainer. I agree that it is inadvisable to use such a device outdoors. The book holder is not for the road! It’s for indoor training. If anyone would read the description you would figure that out. As far as audio books not all books are audio and some have pictures like Linerd Zinns book “The Art of Bicycle Repair “. The book holder looks like it can hold a laptop as well great if you want to watch a movie with headphones on as indoor trainers are noisy. I think the umbrella thing is lethal and wouldn’t last two seconds when it’s blowing hard here in East Anglia. Also, I think we need bright colours for cycling in wet weather and dull light to make us more noticeable to oncoming drivers. Love the foldaway trailer though – want one! all day track stand in the rain reading with a bottle if spritzy water and a coffee with the nice feel of wood, spare books in satchel, mozart on iPod,iPhone at the ready. Avtually put it on a wind trainer and sit there with those fancy wheels advocating cycle safety to passing motorists. 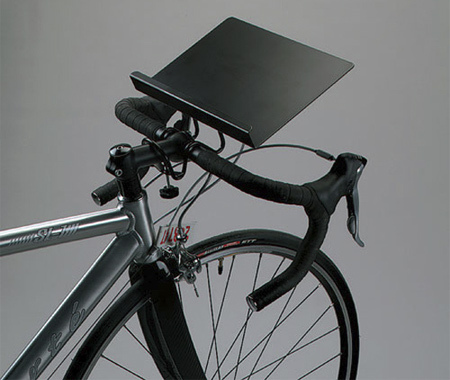 Hey folks – the book holder is for a stationary bike during the winter months when you can’t ride outside. Awesome stuff but the book mount!?? NAAH; so very unsafe! I agree that the book holder is marketed for indoor cycling, but I don’t think the idea of using it outside is that stupid. There might be maps and directions or even local history in the book, and you could read a few sentences or glance at the map, when it’s safe to do so, perhaps after stopping, or perhaps when riding with no hazards close to you. It would be a lot quicker than taking a book from a pannier or rucksack. Is the bookshelf on the bike unsafe? It depends on when you use it. Right now I have my bicycle mounted indoors on a trainer stand, so that would be extremely useful without any real safety risks. I’m not going anywhere. If I used that while riding my bike outdoors, then we would have a problem. I use/devise bookholder for my lap-desk, but for my bike, all I need to read is taken care of with a tookbag that mounts to the front handbars and has a clear flip-up holder for sections of maps folded to show only the local area, and for lists of destinations (for garage sales on Saturday morning). As for the other item I would like to acquire: the umbrella holder, as was pointed out, only protects the riders when stopped, as it has no feature than tilts it ahead of the rider when moving, when the rain comes from ahead more than above. I ride in rain with an umbrella in my left hand, doing the tilting manually at each stop. I pod bike is very nice, I love that bike….